Getting babies to sleep is a time-honored struggle for most new parents, and all tackle the challenge in different ways. For some, a cradle is an essential part of the sleep equation. In this article I’ll outline the features of a cradle, discuss why you might want one, and review my top picks for the best baby cradles. What is a cradle? Think of a cradle as a rocking crib – a place to gently sway your newborn into dreamland. They are for young babies who cannot yet roll over or push up. Keep in mind that you need a mattress (usually included with the cradle) and sheets for the specially sized cradle mattress (not included with the cradle, in most cases). Should I get a cradle? If you plan to have your baby sleep near you during the first few months, perhaps next to you, then a cradle is a great option. With a cradle next to your bed, you can reach over to rock the baby a little when she wakes up at night. Sometimes the rocking motion by itself will soothe the baby enough so that he falls back to sleep. Rocking the baby in the cradle without getting out of bed is very convenient, and it makes the many middle-of-the-night wake ups a little less grueling. If you decide to use a cradle, the next question you might have is ‘which one should I get?’ Luckily for you, I’ve already done the research. Here are the five best baby cradles for your newborn. The BABYBJORN Cradle is my personal pick for best baby cradle. The cradle features mesh fabric sides for greater ventilation, lessening the risk of Sudden Infant Death Syndrome (SIDS). The fabric is machine washable and easy to clean. Don’t let the fabric sides fool you – this cradle is sturdy, and can hold up to 18 pounds, which generally accommodates babies under six months old. The cradle is also exceptionally light in weight, and easy to move around the house. A small amount of assembly is required, but it is far less complicated to put together than any other assembly-required cradle. It should take just a few minutes to set up the BABYBJORN cradle in your home. Like all BABYBJORN products, this cradle has a more modern style, which might not be appealing to all. It’s an oval shape that has a relatively small footprint so it can easily fit next to your bed, even in a smaller bedroom. Organic sheets for the cradle mattress are available from BABYBJORN. The major detractor with this cradle is the price. It’s one of the most expensive options on my list, costing between $272.20 and $349.95. If you decide you can splurge on this product, I doubt you’ll regret it. This is certainly one of the best baby cradles on the market. Another good choice is the Baby Home Dream Portable Cot. The most notable feature of this cradle, in my opinion, is the solid fabric sides. If you have a little one who just can’t get to sleep because there’s too much to see all around, then this might be a good choice for you. The fabric is cotton on the inside, and nylon on the outside, and comes off of the frame for easy washing. The frame itself is relatively light aluminum, and the whole cradle weighs about 13 pounds, making it possible to move it around the house. 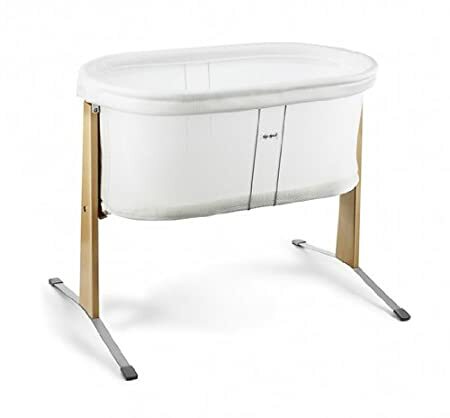 Another interesting feature of the Baby Home Dream Portable Cot is that the legs adjust, converting it from a rocking cradle to a stationary bassinet to a rolling cot with the push of a button. This cradle also comes in multiple colors, and includes a rather thick mattress. In fact, the mattress is the cushiest out of all the cradles I reviewed, easily making this one of the best baby cradles. It has three layers of comfort: the padded floor of the cradle, the high-density foam mattress, and a supportive mattress pad. This cradle even comes with a 100% cotton fitted sheet. What are the downsides? Like the BABYBJORN, this cradle is expensive, costing anywhere from $299 to $349. Some might not appreciate the more utilitarian look of this cradle, as well. If you want a solid-side cradle, however, this is the choice for you. A more budget-friendly option is the Dream On Me Rocking Cradle. At under $100, this is a reliable option for those who don’t want to spend a lot on an item that will be used for less than six months. Remember, once your baby is rolling over or pushing up, the cradle poses a safety hazard and should no longer be used. The Dream On Me Rocking Cradle has a more traditional look, and comes in a variety of non-toxic wood finishes. Even though the cradle is made of wood, it weighs only 15 pounds, making it possible to move it around the house on occasion. Perhaps the lighter weight is due to the fact that the bottom of the cradle is actually made of fiberboard, supported by a crossbar. Overall, this cradle is of somewhat lower quality than more expensive options, but it will serve its purpose and will allow you to spend more money on longer-lasting baby items, like a crib or stroller. The above-mentioned cradles all rock, but the Mary Gliding Cradle actually glides. The best baby cradles provide a gentle swaying motion to help your baby relax and sleep, and the Mary cradle certainly accomplishes this. Another benefit to the glider is that there is less worry about other children rocking the cradle excessively and potentially tipping it over. A one-inch thick mattress pad is included with the cradle. This glider also has a stopper to keep it stable when necessary. 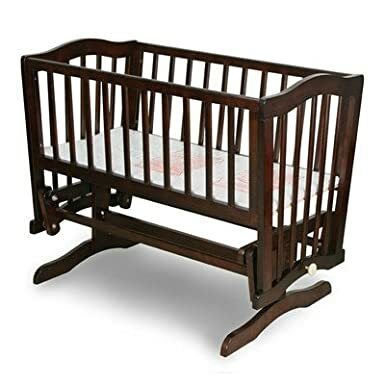 The style of the Mary Gliding Cradle is traditional and it’s made from wood with a non-toxic finish. The glider is on the heavy side, at about 35 pounds, so it is not what I would consider portable. This cradle is a little more difficult to assemble than the others on this list, so if you’re not up for a project, I would avoid this one. Assembly can take an hour or more. 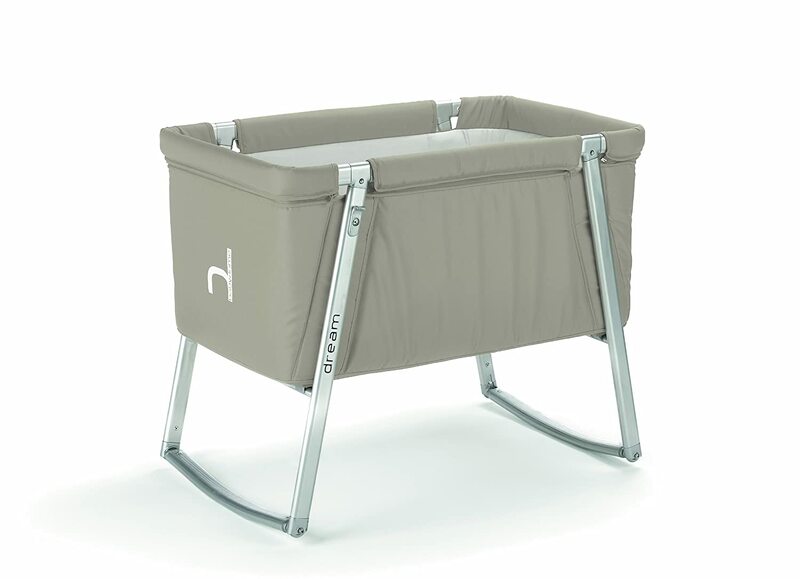 Another glider, the Sorelle Dondola Cradle, made my list of the best baby cradles. Like the Mary cradle, the Sorelle is heavy (35 pounds), but it sits on removable casters so it’s possible to move it from room to room. 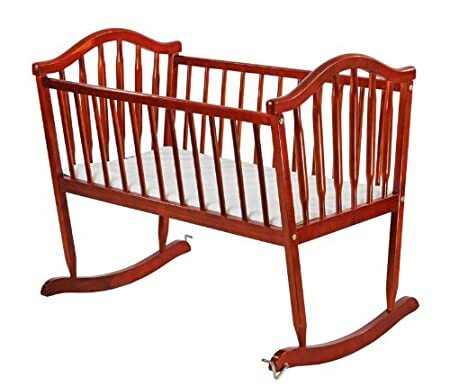 This cradle comes in a variety of finishes and is made from solid pine. 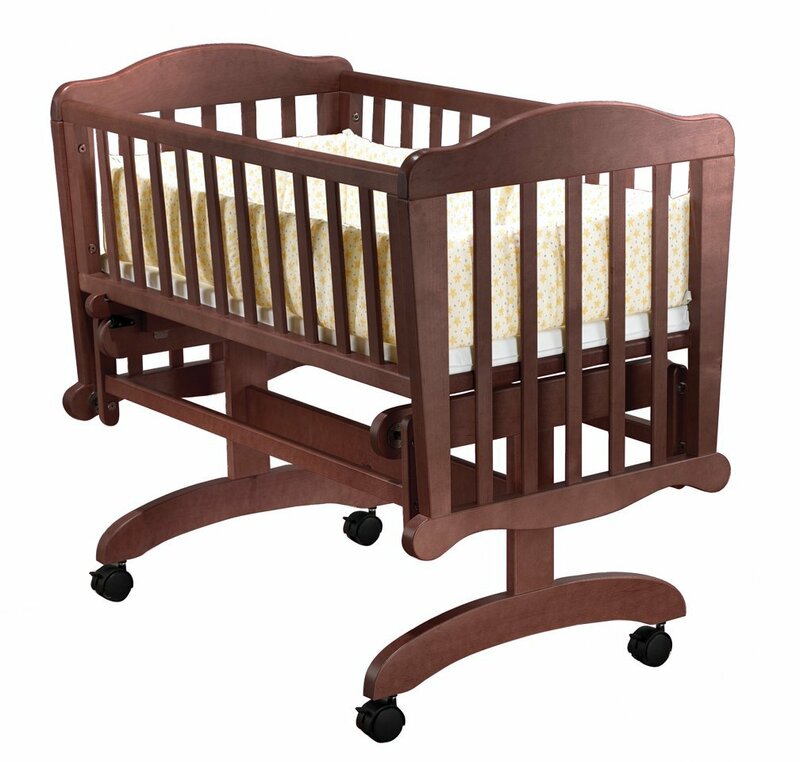 This cradle is a slightly more modern style than the Mary cradle, but you pay for that style with the higher price. Also like the Mary cradle, the Sorelle Dondola includes a thin, but firm, mattress. Your baby is sure to prefer your arms to any cradle, crib, or seat, but it’s nice to know you have a safe and relaxing place to put your baby when he’s not in your arms. Any of these cradles will do the job just fine, and hopefully, help lull your little one into dreamland.